Dr. Johanna Wolfson at the U.S. Department of Energy is reimagining the energy innovation landscape. Dr. Johanna Wolfson and the full lineup of keynote speakers demonstrates the high caliber program offered by the CleanTech Innovation Showcase, which has grown into one of the leading cleantech innovation events available today. CleanTech Alliance announced Dr. Johanna Wolfson as the latest keynote speaker for the CleanTech Innovation Showcase 2017 to be held on June 26 in Seattle. Dr. Wolfson serves as Tech-to-Market Director within the U.S. Department of Energy’s (DOE) Office of Energy Efficiency and Renewable Energy (EERE). Together with her team, she is reimagining the energy innovation landscape and improving public-private sector collaboration for technology transfer. EERE's Tech-to-Market programs address the underlying structural challenges that weaken the American innovation ecosystem by removing the barriers that prevent promising advanced energy technologies from being explored by the market. For example, Tech-to-Market’s experimental initiatives are bringing entrepreneurs and small businesses into world-class DOE national laboratory facilities to build their products in a way that engages outside industry and prepares them for investment. Dr. Wolfson leads a variety of initiatives, including the Small Business Vouchers pilot, the Cleantech University Prize (Cleantech UP), and Energy I-Corps. The CleanTech Innovation Showcase 2017 will explore how the convergence of research, policy and industry is driving innovation across clean energy and sustainable technologies. Dr. Wolfson is the latest keynote speaker announced. She is joined by Dr. Mark Peters, Director of the Idaho National Laboratory, and Steven Martin, Vice President and Chief Digital Officer of GE Energy Connections. Before joining EERE, Dr. Wolfson was with the Fraunhofer Center for Sustainable Energy Systems in Boston where she led TechBridge, an innovative program for startups that worked to mitigate risks for investors and strategic partners by providing demonstration and validation services from applied research laboratories. She earned a Ph.D. in physical chemistry from MIT, where she conducted research on photo-induced solid-state dynamics. 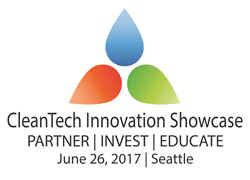 Held June 26, 2017, at the Bell Harbor International Conference Center in Seattle, the CleanTech Innovation Showcase is the region’s premier one-day conference focused on technology and business innovation. The event convenes 500+ cleantech industry leaders, investors, policymakers and media. More than 75 companies were featured at last year’s event, including 24 presenting companies. CleanTech Innovation Showcase registration is now open. Additional branding opportunities are available through several customizable sponsorship and exhibit packages. Contact Kate Roze at kate(at)cleantechalliance.org or 206-389-7255 to meet your branding needs. CleanTech Alliance represents more than 300 member companies and organizations across the Northwest region. Founded in 2007 by business leaders, the organization facilitates the generation and growth of cleantech companies, jobs, products and services to advance the cleantech economy. CleanTech Alliance offers a range of business services and benefits uniquely designed to help businesses gain visibility, access services at a lower cost and benefit from public policy. Learn more at http://www.CleanTechAlliance.org.